Designed mobile phone case for Samsung Galaxy S9 Plus 6.2 inches, please confirm your cell phone model before order it. Easy to use, the Samsung Galaxy S9 plus case has card slots on the inside as well as space for cash and receipts. So you can take credit cards, identity card, all other cards and cash and you do not have to pack a separate wallet. Precision cut-outs for all ports, access to all controls and functions without removing the case. 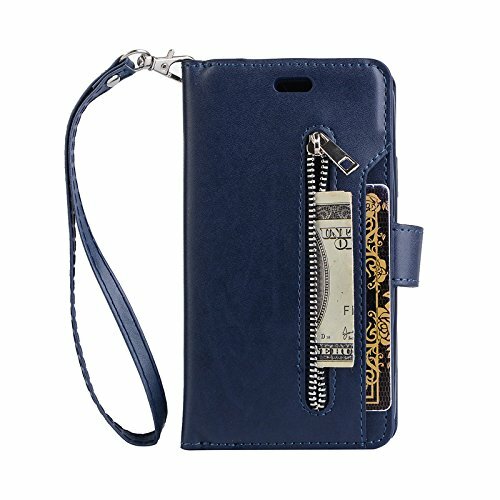 Fashion style wallet for Outdoor shopping, the Case will protect your phone with protection against drops, blows and bumps, keeping it in perfect condition all the time. 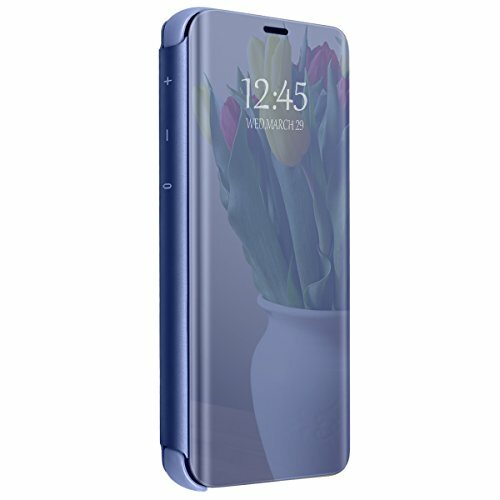 Provides complete all-round protection for your phone, including the display. The phone is well secured in a tight-fitting shell to ensure that it does not fall out in a case. Closed, the front flap of the leather case protects the display and prevents breaks in a case. 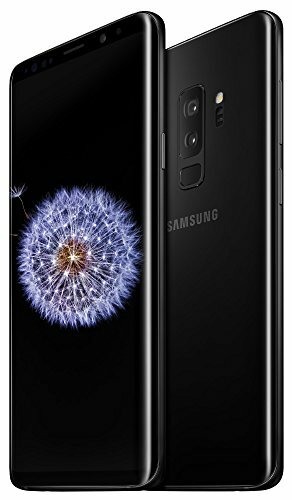 ♤【9H Hardness】wear-resistant protective film protects the Galaxy S9 Plus from unnecessary wear and scratches. ♤HD resolution: 【99% HD】 and sensitive touch give you a high quality image and video experience. ♤Anti-fingerprint: coated with a hydrophobic and oleophobic transparent layer, the glass prevents fingerprints from sweat and oil. ♤Precision design: 100% new, precise laser-cut tempered glass,【Delicate Polishing】. ♤Includes: 2*Screen protect, wet/dry wipes, dusting stickers, microfiber cleaning cloth. 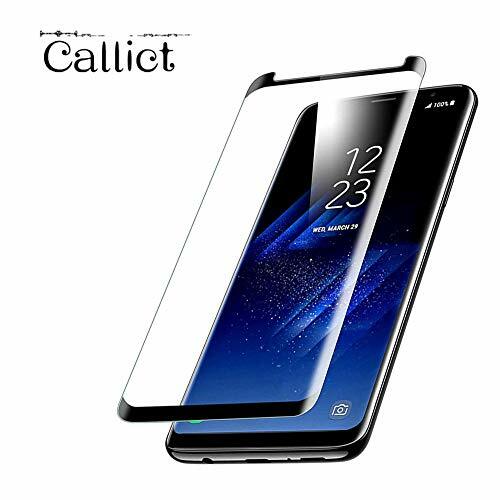 ✿ Specially designed for Samsung Galaxy S8 5.8"/S8 Plus 6.2"/ S9 5.8"/S9 Plus 6.2".Slim Luxury Mirror Flip Cover Can be Shiny Plating Makeup Mirror. ✿ The Samsung Galaxy S9/S9 Plus mirror case made of Hard PC + Soft PU leather,the front and back cover is PC,the connecting portion is premium PU leather.Raised back side corners for defense against surface scratches,easy access to all buttons, control port,housing Precise cutting speaker,charging port,audio port button. 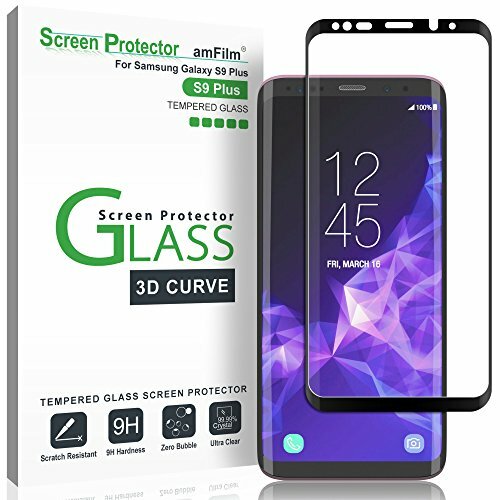 ✿ Ultra Clear,Extreme Responsive,Built in kickstand that lets you make hands-free video calls, read, or watch movies anywhere comfortably.Unique electroplating surface mirror design allows easy access to all buttons without remove the Samsung Galaxy S9 / S9 Plus case. 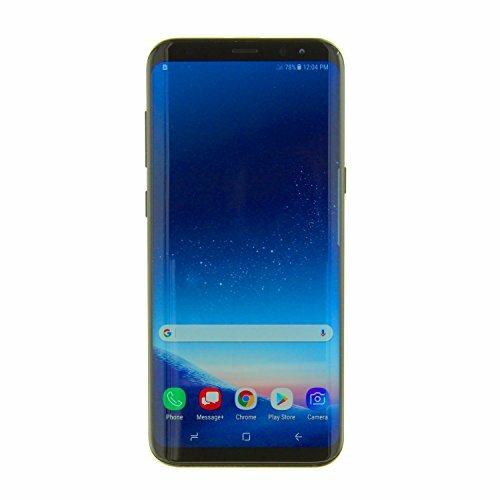 ✿ When Samsung Galaxy S8 / S8 Plus / S9 / S9 Plus screen lit,you can see the information through its cover without having to open your Samsung Galaxy S8/S8 Plus case.Clear View Flip Cover allows you to see the entire front cover through the display window. 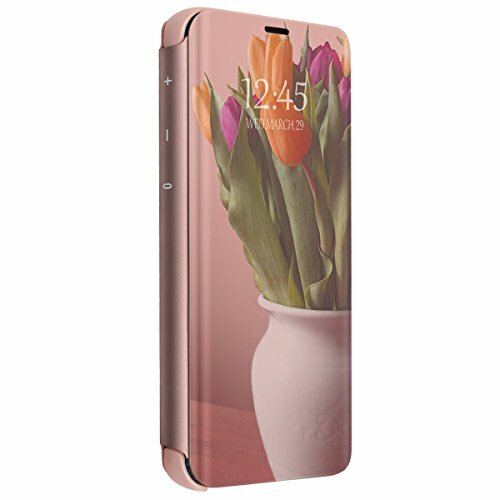 ✿ Radiant and ultra thin Mirror PC design allows for a clear and polished reflection.Due to the different production batches,part of the Samsung Galaxy S8 cases have the protection film. 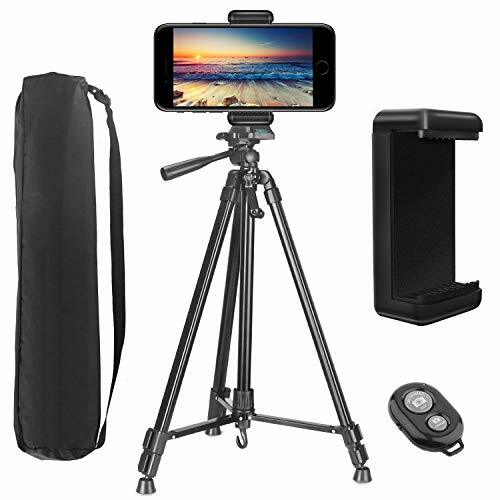 【Adjustable 62 Inch Tripod】：Extends to 62 inches, 3 section aluminum alloy legs. Built-in bubble view levels and 3-way head to allow for tilt and swivel motion, portrait or landscape options. 【Phone Tripod】：Package Include Cellphone Holder Mount : Easy attachment & padded grip to avoid cellphone damage. Adjustable phone adapter fits all phone with width between 2" to 3.3". Compatible for Apple iPhone XS / XS Max / XR / X / 8 / 8 Plus / 7 / 7 Plus / 6S / 6S Plus / 6 etc. Fit for Samsung Galaxy note 9 / note 8 / S9 / S9 Plus / S8 / S8 Plus / S7 / S7 Edge / S6, for Galaxy Note 4 Alpha Mega 2 and Other Smartphones. 【Camera Tripod】：Built in 1/4 screw, Compatible for Nikon Canon Pentax Sony Panasonic Olympus Kodak Fujifilm Casio, fit for DSLR cameras / Compact Cameras / mirrorless cameras / Camcorders, for all GoPro Hero 7/6/5/4/3+/3 Session, for other GoPro-like action cameras as DBPOWER /Garmin Virb XE /SJCAM SJ4000. 【Wireless Remote Shutter】：Lightweight and small enough to put in pocket or as a key chain. Compatible with Android and Apple. No apps needed to download for use simply connect to wireless remote. Pictures can be taken up until 30 feet away. 【Lightweight & Compact】： Made of high quality aluminium. Weight 2.53 lbs and minimum size 19.6 inch makes it a portable and practical piece of equipment. Package including a water-resistant carrying bag, perfect for travel. 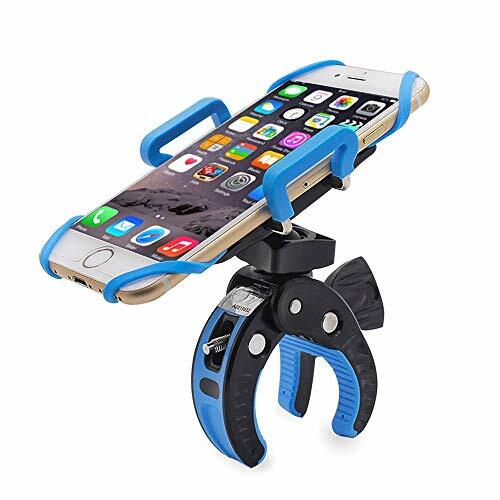 Excellent Stability: YOSH bike phone mount always stands on your bike extremely sturdily with two rubber pads inside the handlebar clamps, which significantly enhance the friction and thus ensures the excellent performance of mounting. 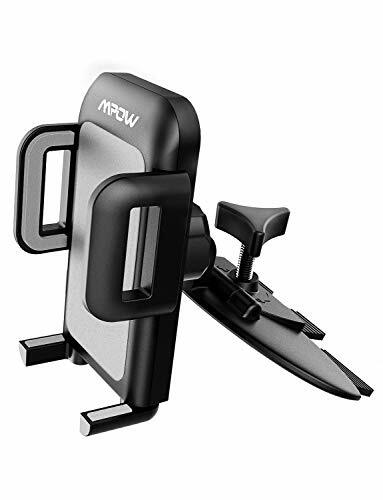 Universal Compatibility: This bike phone mount can sturdily holds iPhone Xs, X, 8+, 8, 7+, 7, 6+, 6, 6S, Samsung Galaxy S9, S8, S7 Edge, S7, S6, Note 8, and more; fits all smartphones with size up to 7.8'' in length (200 mm) and 3.9'' in width (100 mm). Double Protection: Strong built-in metal telescopic arms provides 2 points of contact with your device, elastic silicone band provides additional 4 points, all 6 points of contact working together to reinforce the durability and prevent your device from falling off your bike, regardless of road vibrations or impacts. 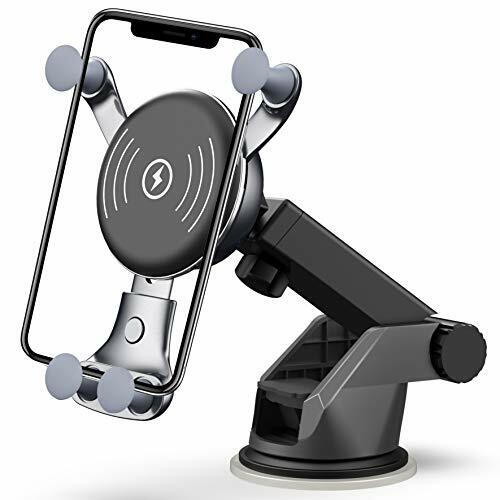 Flexible Operation: YOSH bike phone mount serves you with the best angle for checking your device; you can adjust the 360° rotatable ball joint anytime. The ergonomically designed butterfly bolt saves your time and efforts in screwing and fitting the mount on your bike. Lifetime Warranty: YOSH provides Lifetime Warranty on YOSH bike phone mount to target 100% customer satisfaction. 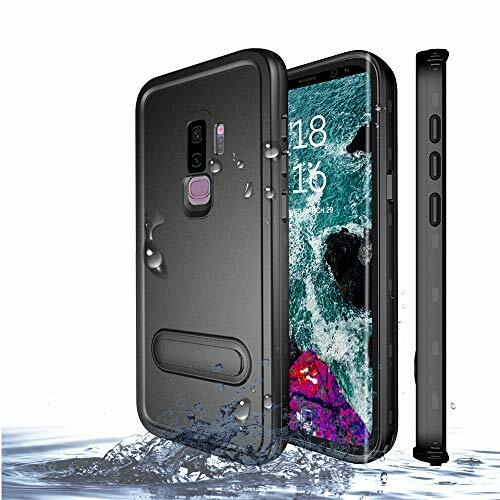 【WATERPROOF】Compatible with Samsung Galaxy S9 Plus (6.2 inch). IP68 Certified waterproof rating, Safe within 1 hour underwater 6.6ft/2M test by 1000 times. Full-sealed cover stops any dirty and dust into your Galaxy S9 Plus. Limited underwater10ft/3M within half hour. 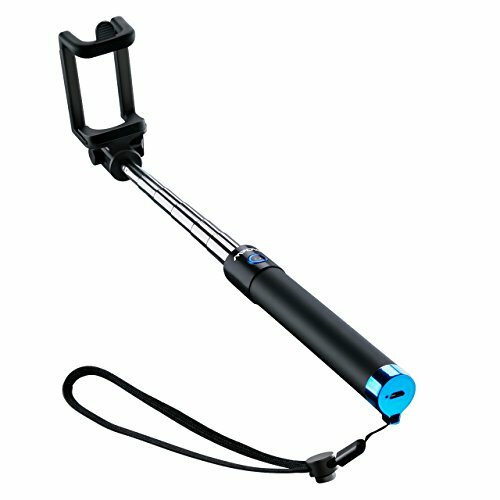 Great for all outdoor activities such as Underwater Photography, swimming, surfing, hiking, cycling, skiing and daily use. 【WIRELESS CHARGING & MULTI-PROTECTION】: Supports wireless charging without taking off your s9 plus waterproof phone case. Full body protection designed to exceed Military Standard 810G-516, guard your phone even after 1000 times drop from 6.6ft/2m height. Not only waterproof shockproof, but also dirtproof snowproof, rugged to adapt to all harsh environments. 【KICKSTAND & SENSITIVE TOUCH】It was designed with built-in kickstand, so just free your hands with horizontal viewing when watch movie or video-chat. Built-in screen protectors protects for scratches without compromising sensitivity or clarity. Completely fit in with the touch ID function. 【EASY INSTALLATION】: Fully sealed even after many times open and close. Two covers (front/back) snap on design makes it fast and easy to install or take off in seconds. There is a pring in the accessories. You can use the prying tool to open and remove the waterproof case easily without damaging it. 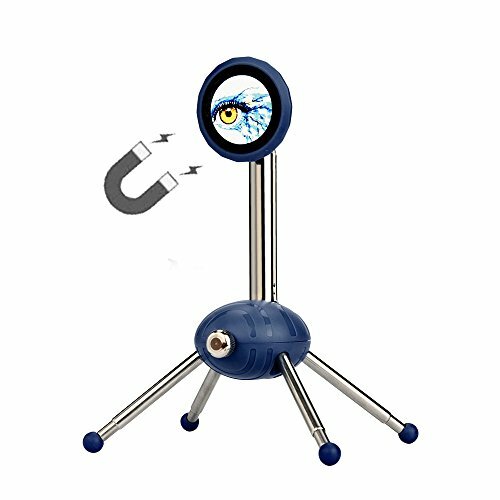 【INNOVATIVE DESIGN】Perfect Stand View with Built-in Magnetic Kickstand. Attached HD clear scratch resistant screen guard + Eight colors back cover to choose from, each coming With a Lanyard. Precise design of each button and port based on Galaxy Note 9 outline. Ensure each button and control, like mute & power & volume button & USB hole. Reinforced bumper. 【Unique Exterior and Outflow Design】Our air purifier is a crowd-funding product which designed by professional designers. The white design of magnetic head cover is full of fashionable & technological sense. Unique patented wind path design enables the air purifier maximize it efficiency to clean more air. 【Intelligent Air Quality Detection】Built-in air quality sensor automatically detect indoor air quality and shows it by the color of indicator light, and the air purifier can automatically adjust the fan speeds to clean air. 3 adjustable fan speeds can be easily switched by smart touch button. It works very quietly and won't disturb your sound sleep at night. 【Excellent Air Cleaning Performance】With 3-in-1 HEPA filter, this air purifier effectively gets rid of up to 99.8% of allergens, dust, pollen, smoke, odors, mold spores, pet dander and particles in a diameter of 0.1 to 0.3 micron, providing a fresh breathing environment to people who need high quality fresh air or are allergic to dust & pollen. 【Built-in Wireless Charger】The smart charger board in the head cover of this air purifier offers a convenient way to charge your cell phones. 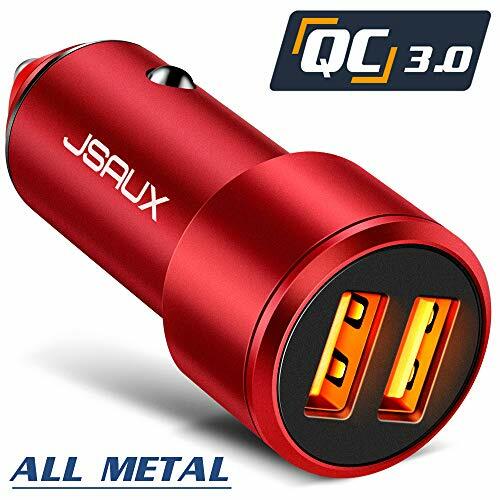 Compatible with QI-enable devices like iPhone X/iPhone 8/iPhone 8Plus, Samsung Galaxy S9/S9+/S8+/S8, SONY Z3V/Z4V. This function activates after plugging in power. 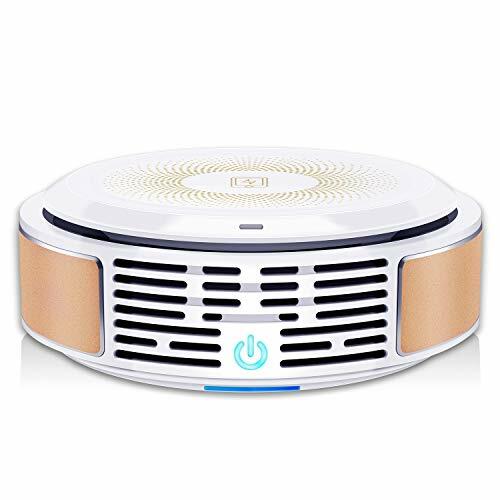 【Cleaning Air Anywhere】This portable air purifier has small size of 6.2*6.2*2.7 in, highly compact and space-efficient. It can be used at home, office and vehicles, effectively solving the air problems caused by pollen, pets and dust. IMPORTANT NOTICE: This is a small air cleaner purifier which can only purify in a small room (5-8 cubes of space), please understand. TeamObsidian Bike Phone Mount [ Size L ] Made of Durable Non-Slip Silicone. 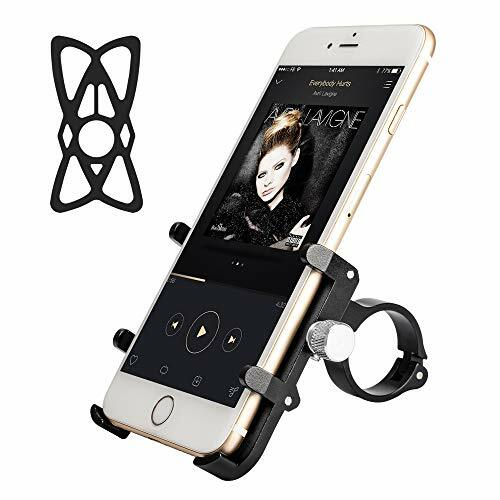 Mobile Cellphone Holder/Universal Cradle for All Bicycle Handlebars and 99% of Smartphones: iPhone 8, 7, 6, 5, Samsung etc. THE ONLY 2 SIZE SILICONE BICYCLE PHONE MOUNT ON AMAZON. Unlike others, we designed 2 models tailored to fit 99% of modern smart phones. The silicone bands only fix the edges of your smartphone leaving the screen free so you can easily scroll tap and navigate your apps. SIZE M - BEST for Android and Apple cell phones with screen sizes between 4 to 5 inches. Fits on: i Phone 8, 7, 6, 6S, 5, 5S, 5SE, 5C, 4S >>> Samsung Galaxy J5, J3, A5 >>> Google Pixel, Pixel 2. Can be mounted Vertically on the handle bar or Horizontally in the center (on the stem). EASY ON / QUICK RELEASE - Attaches and detaches in seconds exactly as a watch band. Easily mount it on the handlebar or the stem and have your phone with you everywhere. Can be used outdoors or indoors: on a mountain, road, street bike, scooter or motorcycle but also on stationary, exercise, spin bike. Perfect fit even for trainer, stroller, wheelchair or shopping cart! LIFETIME MANUFACTURER WARRANTY - This is the only phone holder for bike you will ever need. Activate your warranty and enjoy you black, anti shake and light bike holder a life long. Your purchase is also covered by our IRONCLAD GUARANTEE! 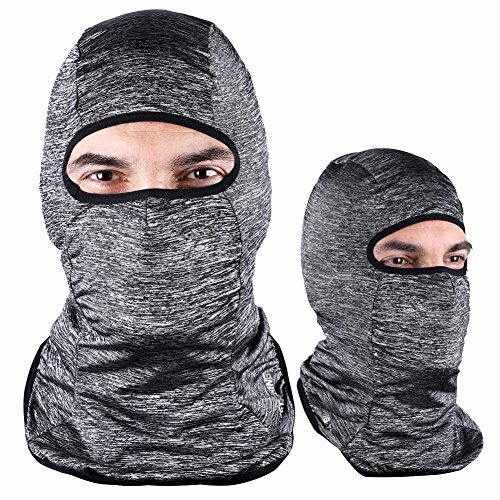 Add To Cart Now to seize our 2019 OFFER completely risk-free! 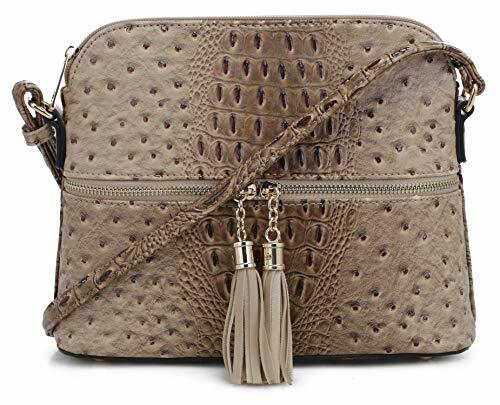 STYLISH & FUNCTIONAL: This stylish medium size dome crossbody purse features adjustable long shoulder strap (12 inches minimum or 24 inches maximum in drop length) with top zipper closure that can be worn many different ways. Perfect for those sunny days when carrying a handbag is not an option. Crocodile pattern on the surface with front center tassel. Good for both traveling and everyday use. EASY TO MAINTAIN: The exterior for this animal pattern purse is made from high quality 100% eco friendly vegan PU leather, while the interior consists of a striped fabric lining and gold tone hardware with center tassels for the front style look. PU faux leather is durable and easy to clean, simply just wipe with water to keep this bag looking new. TRENDY & FASHIONABLE: This trendy fashionable bag features a 1 zipper pockets in front and 1 zipper pocket in back. The top zipper pocket is smooth and easy to open and close. The interior consists of a soft fabric perfect for carrying cell phones or smartphones. It can fits up to plus size / large phones such as iPhone 7 Plus, 8, X / Galaxy S8, S8+, S9, Note5. Interior contains 1 zipper pocket and 1 slip pocket. Styling this small cross body bags is extremely easy to achieve. MEDIUM & LIGHTWEIGHT: This beautiful lightweight small bag measures 10.5" H x 8" W x 4" D. This purse is ideal when only carrying a small limited amount of items such as small wallet, phone, hair comb, keys, sunglasses and a few makeup accessories. 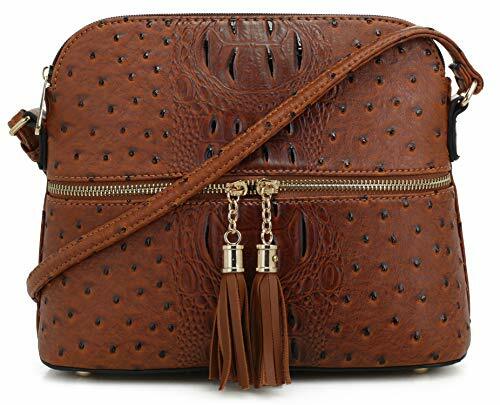 This crossbody bag is not intended for large amounts of items. [HIGH FIDELITY STEREO SOUND & CVC6.0 NOISE REDUCTION TECHNOLOGY]---Bluetooth headphones built-in HD Microphone, featuring CSR chip and CVC6.0 Noise Cancelling technology, reduced the outside noise, You can enjoy the amazing sound quality with superb deep bass and crystal clear treble. [Stereo Bluetooth V4.1 Earphones]---Wireless headphones with trusted in-line controls: you can play,pause,activate Siri, adjust the volume, answer or reject the call from the convenient multi-button in-line controls. And just say "yes" or "no" to answer or reject call, realize the true meaning of hands-free. 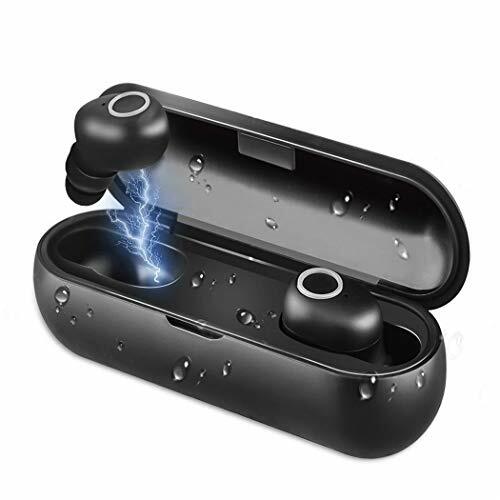 [Quick Connection Sports Bluetooth Earphones]--- The right side of the headset will vibrate when someone calls you. Will never miss any phone calls. With Bluetooth Earphones, enjoy music, exercising, driving, travelling, every moment in your daily life! [IPX4 Sweatproof Sports Earphones]-- Built-in rechargeable Lithium-poly 60 mAh battery. Bluetooth earphones just need recharge for 1.5 hours will support 4-6 hours of continuous talk time and 4 hours music time, 120 hours standby time, it will show the remaining battery status of the headphones on the iOS Phone screen. [Wireless Headphones with wide compatibility]--- only 0.4oz, lightweight, can compatible with most Bluetooth-enabled devices,Such as Xs / X / 8/ 8 Plus / 7 / 7 Plus / 6s / 6s Plus, Samsung Galaxy S9 8 / Note 8 / S6 / S7 Edge, Moto Z / HTC 10 / HTC Desire 10 / ASUS Zenphone 3 / Huawei P10 / 9 Honor8, iPad, iPod, Samsung Galaxy devices, Sony devices, Bluetooth enabled PSP, TV, tablet, computer and more. 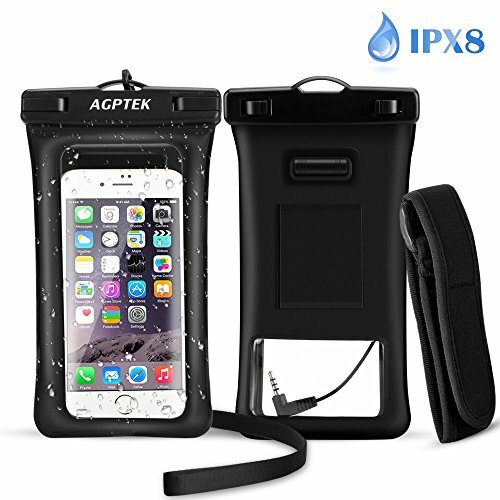 【IPX8 WATERPROOF】 The case protects your smartphone up to 30m/100ft in the water. Kepp your cell phones from water, sand, dust and dirt. Suitable for water sports, such as beach, fishing, swimming, boating, kayaking, snorkeling and water parks etc. 【FLOATABLE DESIGN & AUDIO JACK】 Able to float on the water without worry about missing your device under the water. Comes with adjustable lanyard and armband to meet your different use. You can also enjoy music via audio jack at the same time. 【NOTE】The Instructions Come With the Test Paper. Do Test it Before Your First Use. ★Convenient Shark-Like Magnet and Please Note: The built-in magnet attracts the earplugs when you don't need them, greatly decreasing the burden on ears and giving you a convenient storage way to carry around. NOTE: To protect the earbud cable from the damage of pulling force, please pinch the earplugs instead of the cables when pulling earplugs out of the shark-like magnet which can ganrantee the lifespan of earbuds by using it in the right way. 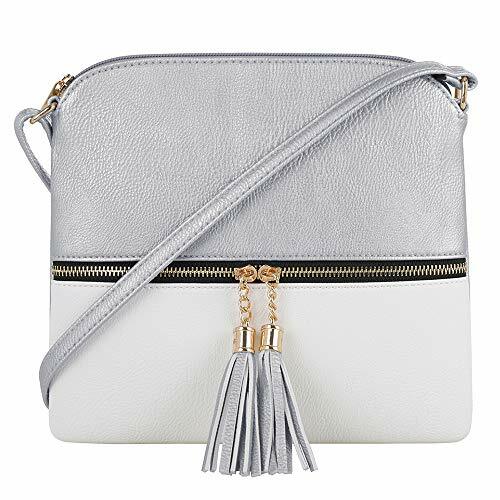 STYLISH & FUNCTIONAL: This stylish cross body purse features adjustable long shoulder strap (12 inches minimum or 23 inches maximum in drop length) with top zipper closure that can be worn many different ways. Perfect for those sunny days when carrying a handbag is not an option. Good for both traveling and everyday use. EASY TO MAINTAIN: The exterior is made from high quality PU leather, while the interior consists of a striped fabric lining and gold tone hardware with center tassels for the front style look. PU leather is durable and easy to clean, simply just wipe with water to keep this bag looking new. TRENDY & FASHIONABLE: This trendy fashionable bag features a simple and clean look. The top zipper is smooth and easy to open and close. The interior consists of a soft fabric perfect for carrying cell phones or smartphones. It is big enough to fit up to plus size / large phones such as iPhone 7 Plus, 8, X / Galaxy S8, S8+, S9, Note5. There is a small zippered pocket inside the main pocket. Styling this small crossbody bag is extremely easy to achieve. MEDIUM & LIGHTWEIGHT: This beautiful lightweight small bag measures 10.25" H x 9" W x 0.5" D. This purse is ideal when only carrying a small limited amount of items such as small wallet, cellphone, hair comb, keys, sunglasses and a few makeup accessories. 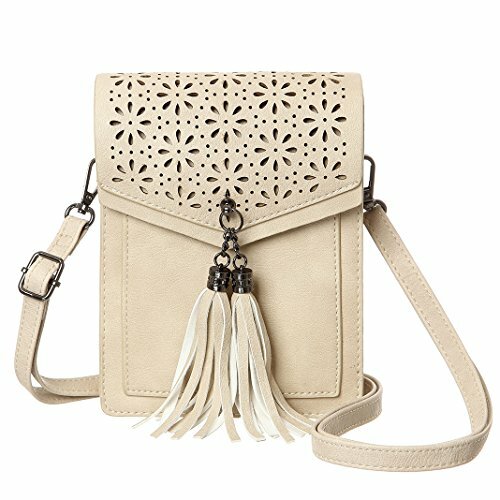 This crossbody bag is not intended for large amounts of items. THOUGHTFUL GIFT: This small comfortable crossbody bag makes the perfect gift for any occasion like christmas, valentines, birthdays and anniversaries. This is truly the one gift that will be enjoyed when going out shopping, work, travel or vacations. Triple-Device Charging: 3 USB ports allow for simultaneous, high-speed charging for driver and passengers. Car Locator: The Roav Charger app records your car's location, setting a pin in the map to help you find your car. Customizable Lighting: Personalize the 16,000-color LED to match your car's interior using the Roav Charger app. What's in the Box: Roav SmartCharge Halo, owner's manual, 12-month worry-free warranty, and our friendly customer service. 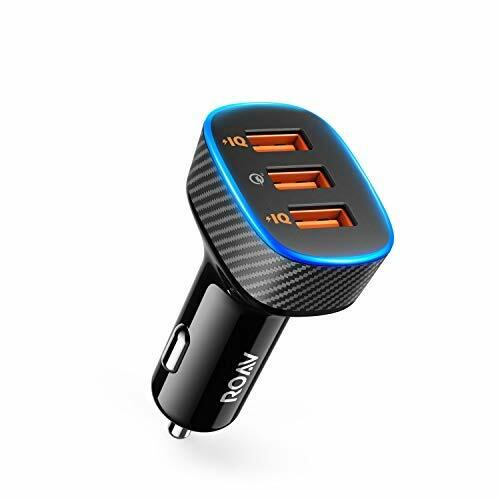 Roav SmartCharge Halo, by Anker, 3-Port USB 30W Car Charger with Quick Charge 3. INSERT the cradle in the CD slot and once it is properly installed this cradle will stay firmly in the CD slot.This is a CD mounted phone holder and it may cover the face of the stereo when it's installed. 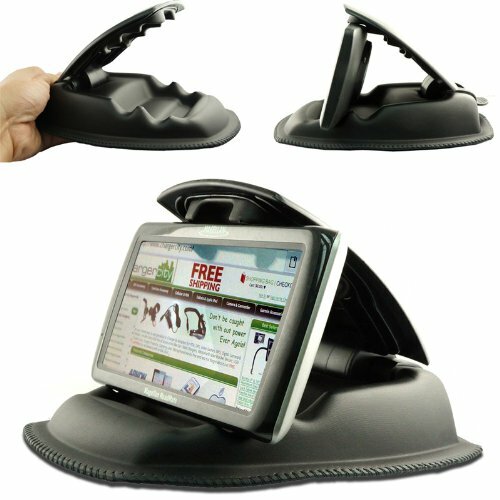 STURDY CD slot phone holder with three side grips design to hold the cell phone tightly. It locates the phone in a much more convenient place to see/touch than the dashboard mounted solutions. YOU set your phone in and squeeze the sides in and they stay put. There's a little button on the side that you press to release the sides and your phone pops out. ADJUSTABLE for angle of view. The phone holder revolves 360 degrees and pivots to various angles. GENERALLY this product could hold your phone in a case or without a case. 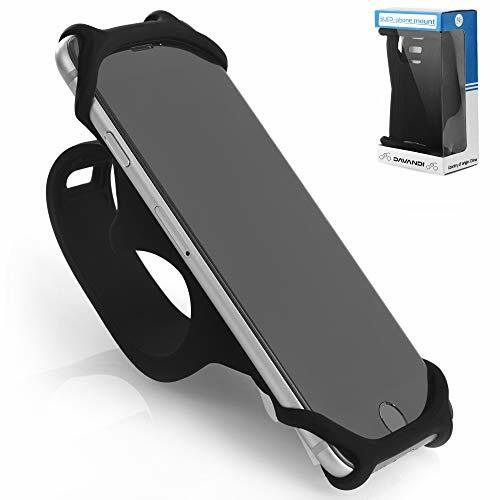 If the product could not hold your phone well please remove the case (This mount may not very suitable for wide phones with cover case). ⚡ 10W & 7.5W FAST CHARGER: The wireless car charger not only supports 5W charging, but also supports 10W and 7.5W fast charging modes, which are faster than most chargers on the market that only support 5W charging.10W fast charging for Samsung Galaxy S9/S9+, S8/S8+, S7/S7 edge, S6 edge+, Note8, 7.5W fast charging for iPhone X, iPhone 8/8+ and compatible with all Qi-Enabled devices. ⚡ 2-IN-1 DESIGN: It's not just a fast wireless car charger but also an air vent phone holder. You can use and charge your phone at the same time. No worry about running out of battery while using GPS navigation, listen to music, or answer hands-free phone calls while driving. ⚡ INTELLIGENT PROTECTION: Our wireless car charger has a built-in intelligent chip with multiple protections such as overcharge, overcurrent, short circuit, temperature control, etc. When the phone is fully charged, it will automatically stop charging and it will start charging when the battery power drops to 99%. It ensures a safe charging environment. ⚡ WIDE COMPATIBILITY: The phone holder is suitable for most phone cases, no need to remove your case while charging. It's air vent mount is compatible with most car air vent. ⚡ EASY TO USE ANS SAFE DRIVING: One hand operation. The wireless fast car mount is mounted on air vent, will not block your line of sight while you are driving. You just need to put your phone into the car charger and start enjoying your fast wireless car charging experience. Simple operation can minimize the danger of driving. Credit Card Slots: Cell phone purse insides have SIX card slots at two separate pockets which convenience to classify your personal items, please forget about your wallet. 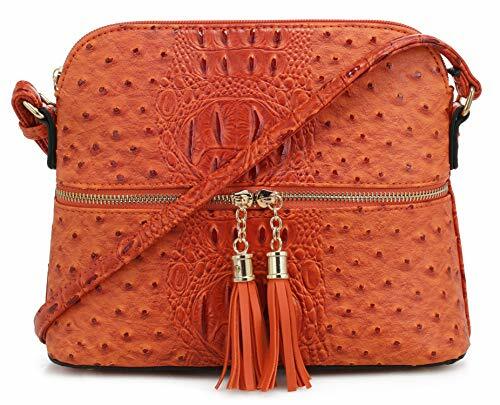 Secure Your Phone:Tassel small crossbody bags for women never go digging for your phone in the bottom of your bag.Never again will your iPhone/smartphone fall out of your back jeans pocket. 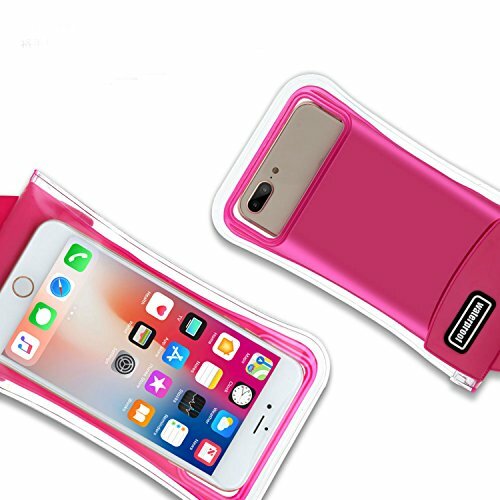 Suitable Phone Model:This stylish Phone purse holder perfect size to fit the smart mobile phones with a screen size of 6.5 inch and below,such as Apple iphone X,8,8 plus,7,7 plus 6S,6S plus,6,6 plus,5S,5C ,Samsung Galaxy Note8,Note 5,Note 4,Note 3,Galaxy S3,S4,S5,S6,S7,S8,S9,S9 plus and other cell phones with right size. Great Gift: Small cross body purse ideal option for outdoor use (walking, camping, shopping etc) and travel, daily life use as well.Fashionable, practical and multi-function design and comfortable to wear. It's also a great idea as a small birthday gift for women/present for the one your love. TWO WORKING MODEL - Bluetooth model: Connect the smart watch to your phone via bluetooth, then you can make and answer phone, view and reply text messages, view app notifications and so on; SIM card model: If you install a GSM 2G/2.5G Network SIM Card into the smart watch, you can use it as a real phone, including answering and dial-up, send/reply messages,take pictures, play music etc..
MULTIFUNCTIONAL SMART WATCH - Image viewer, Music Player, Sound recorder (need put and SD card ), Calculator, Alarm clock, Calendar,Camera (0.3M),Two way Anti-lost. Pedometer, sleep monitoring, sedentary remind, calories counter, exercise mileage counter, helping you adjust yourself for a healthier lifestyle. SYNC FUNCTION - Just connect the smart watch with your phone via Bluetooth, then download and install the APP, so you can read Whatsapp, Twitter, Facebook and other application push messages, view and reply text messages, the time and date will be automatically synchronized. But for iOS system, it not support SMS and App function. 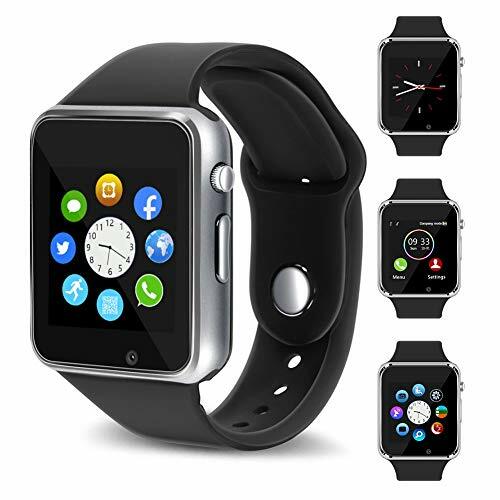 SUPER COMPATIBLE ANDROID AND IOS - This smart watch super compatible with most android and ios phones. Such as iPhone X/8/8 plus/7/7 plus/6/6 plus/6s/6s plus/5/5s (Only Supports Partial Functions), Samsung Galaxy S9, S9 Plus, S8, S8 Plus, S7, S7 Edge, S6, S6 Edge, S5, Samsung Note 8, 5, 4, Google Pixel/Pixel XL, HTC, Sony, LG, HUAWEI, ZTE etc. smart phones. LONG LASTING BATTERY & LIFETIME WARRANTY - More capacity, longer endurance. Full charge requires only about half an hour and the standby time can be up to 5-7 days with full power. No risk, we offer 90 DAYS FREE RETURN warranty for our smart watch. 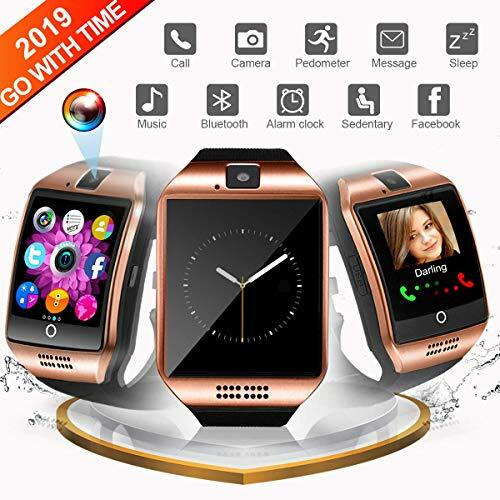 &#x1F495;<b> 【BE AN INDEPENDENT PHONE】</b> Insert a 2G SIM/TF Card into the smart watch, you can make calls directly from the smartwatch, including answering and dial-up, send/reply messages. visit the website or log on Facebook Twitter WhatsApp. You can also take photos and voice records, enjoying music on the watch etc..
&#x1F495;<b> 【MULTIFUNCTION SMARTWATCH】</b> Fitness Tracker watch: Pedometer (steps, distance, calories), sleep monitoring, sedentary remind. Other functions: Image viewer, Sound recorder (need put and SD card ), Remote capture, Alarm clock, Calendar, Calculator, Camera (0.3M), Two way Anti-lost. 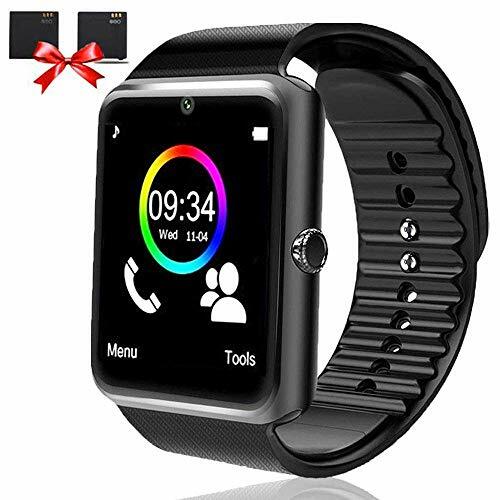 &#x1F495;<b>【WIDE COMPATIBILITY WITH SMARTPHONES】</b>This Bluetooth smart watch can support most android and ios phones for Men Women Kids. Such as iPhone X/8/8 plus/7/7 plus/6/6 plus/6s/6s plus/5/5s(APP can't support), Samsung Galaxy S9, S9 Plus, S8, S8 Plus, S7, S7 Edge, S6, S6 Edge, S5, Samsung Note 8, 5, 4, Google Pixel/Pixel XL, HTC, Sony, LG, HUAWEI, ZTE etc. &#x1F495;<b>【LONG_LASTING BATTERY LIFETIME& WARRANTY】</b>Free-worry for the battery life of our Oumuele smart watch. We specially prepared for you with 2 pcs batteries (one is free gift), and promised with the following usage hours: standby time 100H * 2, Music play 4H * 2, Continuous phone call 4H * 2. Freely contact with us and get full refund if you do not satisfied with our Oumuele smartwatch. Hard Material and Upgrade: The best, the most stable Bike Phone Mount on the market, and other ordinary Bike Phone Mount is different.This Phone Mount is made of high quality aluminum alloy, not easy to damage is very durable.The improved version of the stable design.Securing each corner of your phone tightly to the mount. Universal Compatible and Strongest Fixity: It can accommodate almost any smartphone model, including the larger iPhone and samsung Galaxy. Clip can be compatible with any bicycle and motorcycle handlebars. Two pairs of plastic gaskets are provided and a pair of transparent non-slip padssoft are provided as a gift。Choose the right one and attach it to the handlebar with the clamp, tighten the screws finally, you can make the mobile phone bracket more stable. Multiple Protections: The bike stem phone mount is designed with a cushioned adhesive patch for the 4 claws to absorb shock and protecting your phone from scratches.At The same time in order to consider to increase security on rough terrain, and will not affect access to all control buttons and audio jack, we free to provide a high quality silicone butterfly bands with ,It can help you stabilize your phone again.Don't worry about your phone falling off because it's impossible! Two Mounting Modes and Anti-theft Design: As the mini tools we provide are very simple to install, mounting can be easily mounted to the handlebars, only need to locate and lock nut. As bike phone mounts, we can select transverse or longitudinal mounting modes as per your needs.Our tools and screws use the exclusive caliber, others can not steal your bracket, only you have the key, you are the only owner of it. ☞ Touch Sensitive & Clear Window---The touch screen is very sensitive under water. You can take photos, videos, answer phone calls and receive messages. You can use front and camera as you like. ☞] Friendly Customer Service---Gihery offers every waterproof phone pouch we sell free 1 YEAR warranty. For any reason you are not satisfied,please email us and let let us make it right for you. 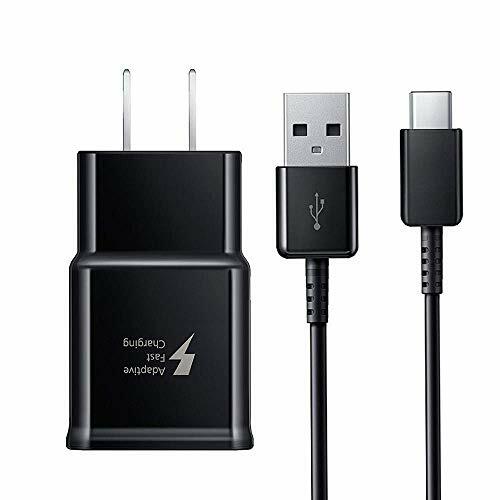 OMPATIBILITY- Compatible AFC Fast Charge device: Galaxy S8/S9 Note8/ S8 Plus/S9 Plus, New Macbook, OnePlus 3T 2, Nexus 5X, Nexus 6P, Pixel, Lumia 950, Lumia 950XL, Moto z, Moto g5, ChromeBook Pixel, Pavilion X2, ZenPad S 8.0, Huawei P10 P9, Huawei Mate 9, Galaxy S8, Nintendo Switch and other usb type c cable device. 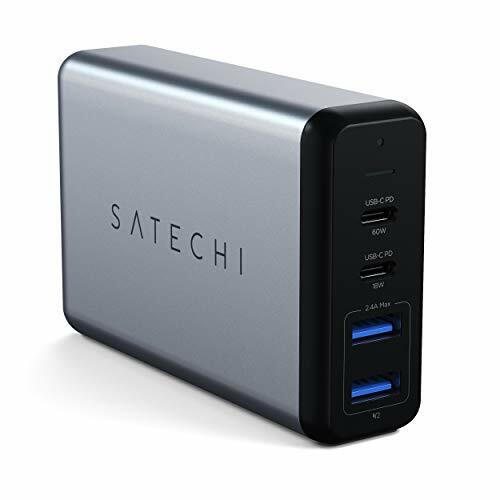 FAST SYNC & CHARGE: Fast Charger Kit charges phones and tablets with USB 2.0 ports at max speed. This charger set charges all other non-fast devices as well. It will charge USB 2.0 phones and tablets that use TYPE C cable at their normal speed. Syncs and transfers files via TYPE C USB data cable. SAFETY GUARANTEE: Multiple built-in safeguards and intelligent IC identification technology protect against short circuit, over-current, over-voltage, over-heating and over-charging. Automatically stops charging when battery capacity is full to ensure your device safety and long lifetime. LIFETIME REPLACEMENT WARRANTY - SUPPORT AND MORE: offers a no-hassle money-back guarantee for a full 30 days. After that, we offer a lifetime return-and-replace warranty for manufacturer defects. Please contact our Customer Service to get a replacement or a refund. High quality stereo audio and bass response, good call quality and superb noise-canceling. Ergonomic and ultra-lightweight in-ear designed with solid sound-insulating material, reduces external noise while minimizing the sound leakage, giving you clear sound. The cord was built in a in-line controller and a high quality microphone, the controller was designed to play/ pause music/ next track/ previous track/ answer phone calls/ hang up phone calls. If you have any question, please feel free to Contact us. Our service team will reply you with satisfied solution within 24 hours. 2-COIL FAST CHARGING - 1.4 times faster than standard wireless charger, built-in two coils offer you much wider charging area. 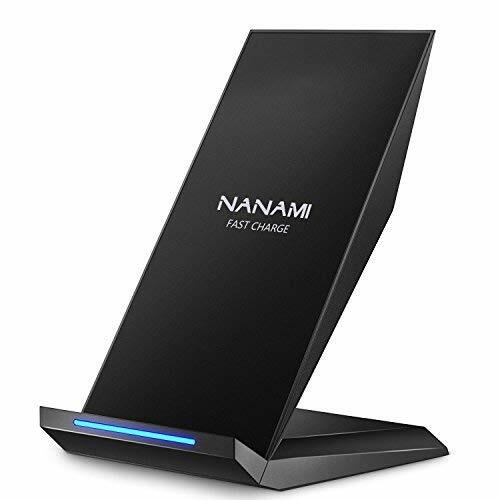 This Quick Charge 2.0 wireless charging stand will juice up your compatible device from dead to full in a short amount of time. ERGONOMIC STAND DESIGN- Unique Sailing Design for Freedom, charging your phone vertically or horizontally, enjoys movie and music without interrupting while charging. Also, you can answer a call without having to unplug. 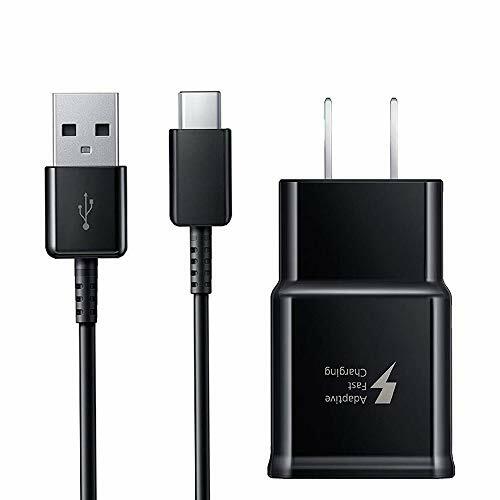 TWO WIRELESS CHARGING MODES- Fast Charge Model: Compatible with Galaxy S9/ S9 Plus/ Galaxy S8/ S8 Plus/ S6 Edge+/ S7/ S7 Edge and Note 9/ Note 8/ Note 5, required QC 2.0 adapter as its power source (Not Included, Galaxy S9's original adapter does not support fast wireless charging) Standard Charge Model: Compatible with standard QI enabled device like iPhone X/XS/ XR/XS Max/8/8 Plus, Some device may require the addition of a wireless charging receiver like other iPhones (Not Included). INTELLIGENT LED INDICATOR- Multi-colored LED lights indicate charging status. Solid blue for standby mode, green for charging mode). Blue LED indicator will flash in 1s/time if your phone is not properly aligned or any metal attachment detected! PLEASE REMOVE ANY METAL AND MAGNETIC ATTACHMENT OR CREDIT CARDS BEFORE PLACING YOUR PHONE. [The Anker Advantage]: Join the 20 million+ powered by our leading technology. [Lasts 6X Longer]: Double-braided nylon exterior, toughened aramid fiber core and laser-welded connectors equip PowerLine+ with superior toughness from end-to-end. [Supreme Compatibility]: Tested in-house with countless USB-C devices; proven to provide a fully compatible, secure and reliable fit. 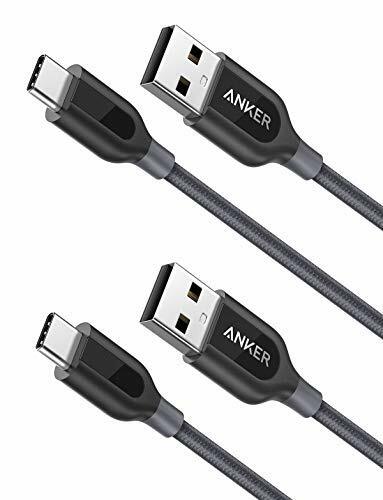 [What You Get]: 2 x Anker PowerLine+ C to USB 2.0 (3ft including both ends), our worry-free LIFETIME WARRANTY and friendly customer service. 【24Hrs Long Battery Life】The Bluetooth headphones for cell phones has 720 hours (30 days) of standby time and 24 hours of continuous talk time per charge cycle. Advanced button design supports terminal restated, volume control, song switching, Siri and other voice assistants summoning. 【High-Fidelity Sound& Noise Cancelling】This Bluetooth headphones for cell phones uses a noise-canceling mic to prevent background noise (CVC 6.0). Compared with other headphones on the market, featuring Bluetooth 4.1 technology the volume is louder and clearer, which lets you enjoy whether you're on the phone, listening to a song or watching a video. 【Comfortable Wearing】This Bluetooth headphones for cell phones features an ergonomic design with an earbud diameter of less than 0.5 mm and 3 different sizes of earbud for less pressure on your ear canal. 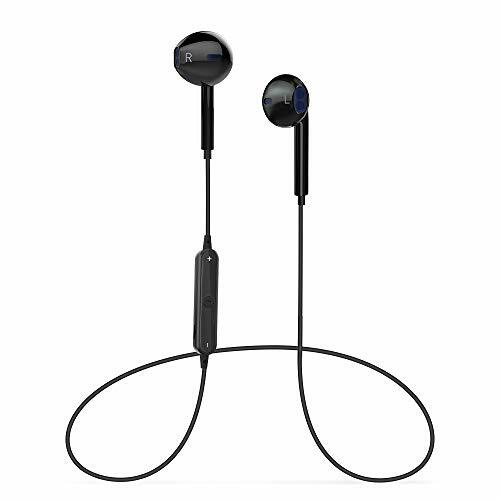 In addition, an additional 2 ear hooks to make Bluetooth headphone more firmly used in your ears. 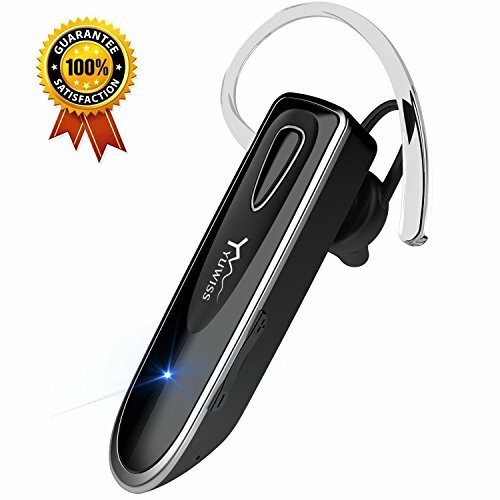 【Pair with All Smart Phones】Yuwiss Bluetooth headphones for cell phones is highly compatible with iPhone XS XS Max XR 7 6 6s and Plus 5 5c 5s, Samsung Galaxy Edge S9 S8 S7 S6 S5 S6 and other iOS and Android smart phone and tablet. This GSM unlocked device is compatible with other GSM service providers such as ATT and Tmobile however is not compatible with CDMA providers such as Verizon or Sprint. Please check with your service provider for compatibility. This Certified product has been tested and certified to work and look like new, with minimal to no signs of wear, by a specialized third party seller approved by Amazon. The product is backed by a minimum 90 days and may arrive in a generic brown or white box. Accessories may be generic and not directly from the manufacturer. TWO WORKING MODE - Using Android Phone: If you install a GSM 2G/2.5G Network SIM Card into the smart watch, you can make phone call directly from the smart watch, including answering and dial-up, send/reply messages,take pictures, play music etc.. You can use Bluetooth technology to connect to your phone, stay connected with display notifications and touchscreen functionality for texts, calls, emails, and app updates. SYNC FUNCTION - Just connect the smart watch with your phone via Bluetooth, then download and install the APP (FunRun), so you can read Whatsapp,Twitter,Facebook and other application push messages, view and reply text messages, the time and date will be automatically synchronized. MULTIFUNCTION - Activity Tracker: Pedometer, sleep monitoring, sedentary remind. Other functions: Image viewer, Sound recorder (need put and SD card ), Remote capture, Alarm clock, Calendar,Camera (0.3M),Two way Anti-lost. 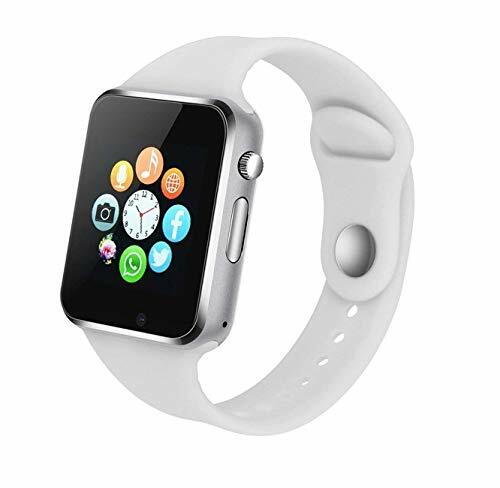 WIDE COMPATIBILITY - This smart watch can support most android and ios phones. Such as iPhone X/8/8 plus/7/7 plus/6/6 plus/6s/6s plus/5/5s (Only Supports Partial Functions), Samsung Galaxy S9, S9 Plus, S8, S8 Plus, S7, S7 Edge, S6, S6 Edge, S5, Samsung Note 8, 5, 4, Google Pixel/Pixel XL, HTC, Sony, LG, HUAWEI, ZTE etc. smart phones. LIFETIME WARRANTY - 100% Satisfaction Guarantee, Free return within 90 days. If you are not 100% satisfied with this smart watch, we will replace it for you or simply return it for a full refund no questions asked. 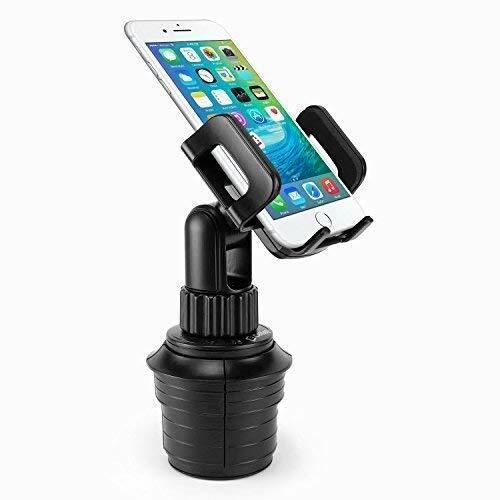 AIR VENT CAR PHONE MOUNT - Easy single hand using. Put in and take out your device with one hand. It is the most handy and easy-using universal car phone holder on the market. 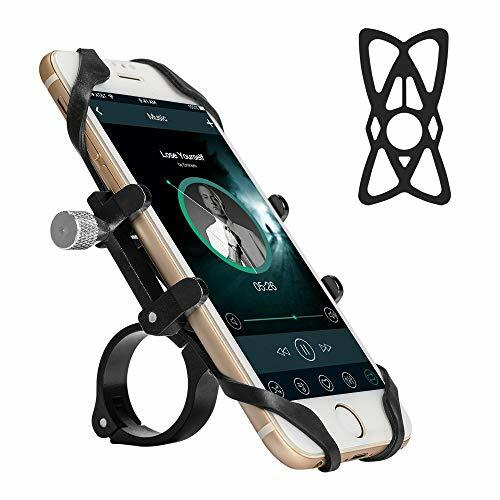 ESPECIAL LOCK MOUNTS car phone holder to air vent extra securely so that car mount will never fall out. 1-minute easy car holder installation. 31566 UPDATED VERSION. The special locking clip that clings to the vent plate and the metal tightening thread and nut provide absolute fixation. Silicon finish surface of a car mount provides firm grip. UNIVERSAL COMPATIBILITY. 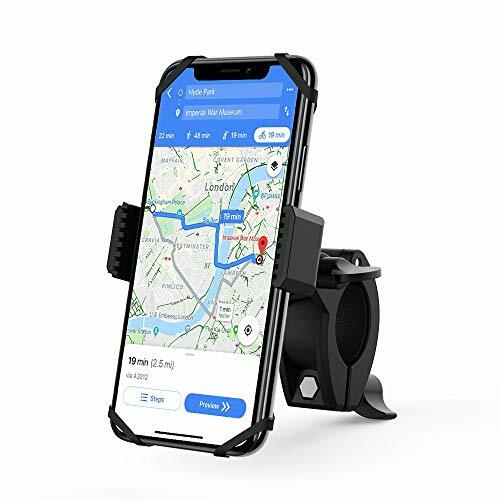 Mongoora car vent mount is compatible with any smartphone from 1.9 to 3.7 inches width - iPhone XS X 9 8 7 6 5 PLUS MAX, Samsung Galaxy S9 S8 S7 S6, LG, Lenovo and More. High performance sound quality with super dynamic deep bass high resolution treble & crisp powerful sound. 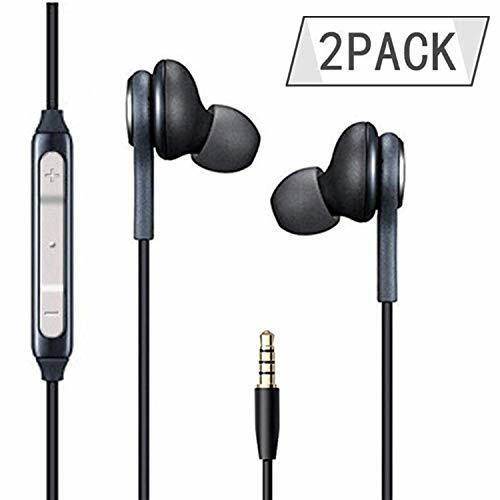 It has perfect stereo sound quality, enjoy full listening comfort with soft, snug ear buds that conform to your ears, bring you the perfect audio enjoyment. Multifunctional: In-line remote control with Play/Pause, Hands-Free Calling, Next/Previous music function.The Microphone is perfectly positioned to enable you to speak without having to move your head. 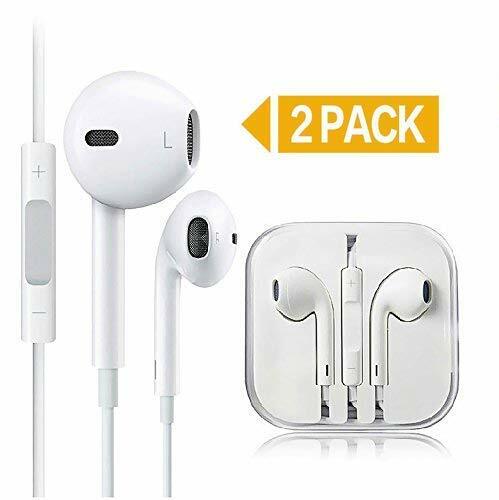 Optimal earphones for all smartphones,Earbuds with mic and volume control.Perfect for iPhone 6s Plus / 6s / 6 Plus / 6 iPhone 5s / 5c / 5 / SE - iPad Pro / iPad Air / Air 2 - iPad mini 2 / mini 3 / mini 4 - iPad 4th gen- iPod Touch 5th gen / iPod Nano 7th gen, Samsung Galaxy S9 / S9 Plus / S8 / S7 / Note 8 / 6, HTC U11 Series, Laptop, Game Players, MP3 Players, Tablet, Desktop DC and Other Popular Electronics. CUSTOMER SERVICE: provide 45 - Days money back guarantees, 24-Month worry-Free warranty with considerate customer service makes your purchase risk-free. If you're not satisfied with the Bluetooth Wireless Headphones or have problem in using, please contact us for replacement or full refund - no questions asked and no any risk. ⚡ 7.5W & 10W FAST CHARGER: Compare to most of chargers in the market that only support 5W charging, this wireless car charger supports 10W Fast Charge mode (10% faster than standard 5W wireless charger) for devices like Samsung Galaxy S9, S9 Plus S8, S8 Plus, S7, S7 edge, S6 edge+, Note8; 7.5w fast charge iPhone XS, iPhone XR, iPhone X, iPhone 8, iPhone 8 Plus. 5W standard charge all other Qi-Enable devices. &#x1F49C; 2-IN-1 FUNCTIONS: It combines a fast wireless car charger with an air vent phone holder. If your phone is out of battery when you're on the way, at that moment this wireless car charger is a solution to meet your urgent need, just simply put your phone this wireless car charger for wireless charging. It is also a phone holder, which is easy for you to grab your phone like using GPS navigation while you're driving. &#x1F697; DROP&CHARGE, SAFE DRIVING: Air vents installation, suitable for most car air vent, gravity and linkage design. What you need to do is just putting your phone into the wireless car charger mount, and its two sides will automatically locks your phone steady. This single hand and one step operation is very convenient and safe for your driving. &#x1F530; PHONE PROTECTION: Holder grips and bottom bracket are made by silicone rubber, which is soft to protect your phone from scratching. Meanwhile, the wireless car charger will hold your phone firmly although the car bumps along the way. Enjoy your wireless charging experience. Aluminium Sturdy Material: The best, the most stable Bike Phone Mount on the market, and other ordinary Bike Phone Mount is different. This Phone Mount is made of high quality aluminum alloy, not easy to damage is very durable. Adjustable Compatibility: It works on almost every smartphone model, including the large iPhone and samsung Galaxy.The handlebar lock matches any bike and motorcycle handlebar and offers two plastic gaskets for easy matching handlebar sizes. Multi-level Protection: The aluminum bicycle phone holder is equipped with a cushion-proof anti-slip sticker. Stick to the four grapple to break the vibration deeper and avoid scratching the bare metal surface of the phone. It is easy to use to answer calls and use navigation. We offer a butterfly silicone pad that once again provides a layer of security for your phone. The bound phone will not fall off and enjoy riding. Two Mounting Modes-Anti-theft Design: As the mini tools we provide are very simple to install, mounting can be easily mounted to the handlebars, only need to locate and lock nut. As bike phone mounts, we can select transverse or longitudinal mounting modes as per your needs.Our tools and screws use the exclusive caliber, others can not steal your bracket, only you have the key, you are the only owner of it. Service Concept: Strive to provide customers with quality service and reasonable price to satisfy customers. If you have any questions about our products,Pls get in touch with us. Popular & fashion: with built-in Bluetooth remote control & great battery, our Selfie stick allows you to take selfies or group photos easily with a better photo sight. Highly adjustable: just turn it on, pair it with smart phone via Bluetooth and then snap. The Bluetooth Selfie stick 270 degree adjustable head ensures that you can capture a best & beautiful angle when taking selfies. An extendable body of 31.5 inches Maximum length allow you to cram in more people or background to take the most satisfying selfies. Light and Compact: the most mini and comfortable travel size in 2018! Only 7.1 inches storing length, foldable & portable design suits for your pocket or bag perfectly. Premium insurance for you: The extra wrist Strap can provide double insurance for the safety of your Mpow isnap x and your phones. ♛ New Upgrade Smart Watch - Stainless Steel Wire Drawing Surface, Precision laminating process, Nano TPU85 material strap, anti-sweat matte surface treatment, ergonomic convex design and soft strap which make wearing more comfortable. Don't worry about the after-sale problems, we provide Lifetime Warranty Service without reasons. ♛ Two Working Model - Bluetooth model: Connect the smart wrist watch to your phone via bluetooth, then you can make phone call, including answering and dial-up, view and reply text messages, view app notifications and so on; SIM card model: If you install a GSM 2G/2.5G Network SIM Card into the smart watch, you can make phone call directly from the smart watch, including answering and dial-up, send/reply messages,take pictures, play music etc..
♛ Sync Function - Just connect the smart watch with your phone via Bluetooth, then download and install the APP, so you can read Whatsapp,Twitter,Facebook and other application push messages, view and reply text messages, the time and date will be automatically synchronized. ♛ Multi-Function & Fitness Tracker Watch - Image viewer, Music Player, Sound recorder (need put and SD card ), Remote capture, Calculator, Alarm clock, Calendar,Camera (0.3M),Two way Anti-lost. Pedometer, sleep monitoring, sedentary remind, calories counter, exercise mileage counter. ♛ Android and iOS Compatible & Guarantee - This smart watch can support most android and ios phones. Such as iPhone X/8/8 plus/7/7 plus/6/6 plus/6s/6s plus/5/5s (Only Supports Partial Functions), Samsung Galaxy S9, S9 Plus, S8, S8 Plus, S7, S7 Edge, S6, S6 Edge, S5, Samsung Note 8, 5, 4, Google Pixel/Pixel XL, HTC, Sony, LG, HUAWEI, ZTE etc. smart phones.No risk, We offer 90 DAYS FREE RETURN warranty for our smart watch. with your company's solutions, and every device remains a secure one. 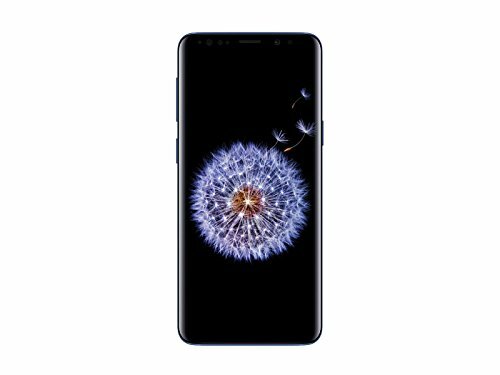 The Galaxy S9 Enterprise Edition keeps your team and your company secure, with regular security updates for up to 4 years after market availability. The Galaxy S9 Enterprise Edition offers lifecycle management that delivers 2 years of purchase Assurance, giving you business continuity so your people can work without interruption. Fast wireless charging: avoid the wires and power up quickly by Placing your phone on a fast wireless charger. 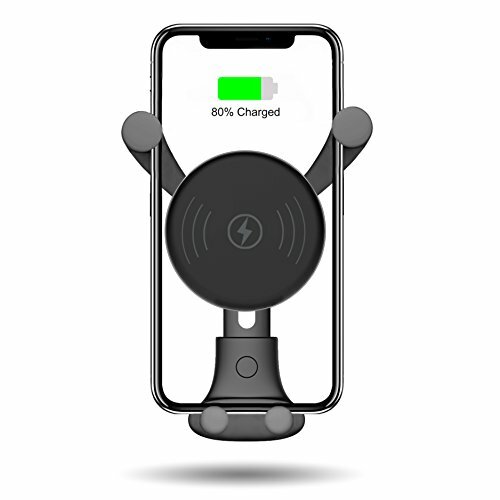 ⚡ 10W FAST CHARGER MOUNT: Compare to most of chargers in the market that only support 5W charging, this wireless car charger supports 10W Fast Charge mode (10% faster than standard 5W wireless charger) for devices like Samsung Galaxy S9, S9 Plus S8, S8 Plus, S7, S7 edge, S6 edge+, Note8; 7.5w fast charge iPhone XS, iPhone XR, iPhone X, iPhone 8, iPhone 8 Plus. 5W standard charge all other Qi-Enable devices. ✅ MOUNTS ONTO DASHBOARD OR WINDSHIELD: This wireless car charging mount can be installed by 2 ways. Comes with strong suction cup for you to mount onto your car dashboard or car windshield. &#x1F499; ADJUSTABLE VIEWING ANGLE: The 360°rotating ball joint on the mount enables flexible viewing angles while driving. The telescopic arm extends from 4.7" - 7.0" and rotates on 270° for a variety of optimal positions. 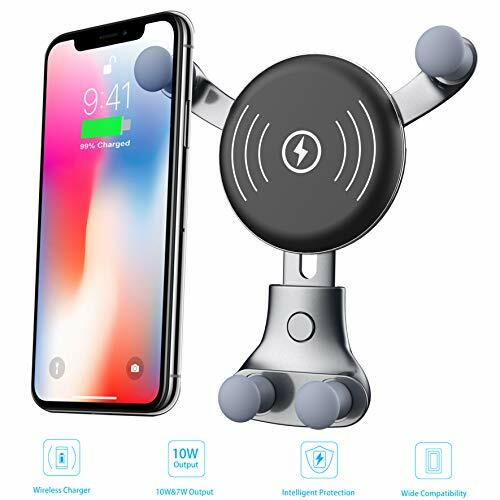 &#x1F512; POWERFUL STICKY SUCTION CUP: With the most advanced designed suction pad stuck on the dashboard or windshield tightly, our phone will never fall away from this wireless car charger mount. Hold your phone firmly even on a bumping road.